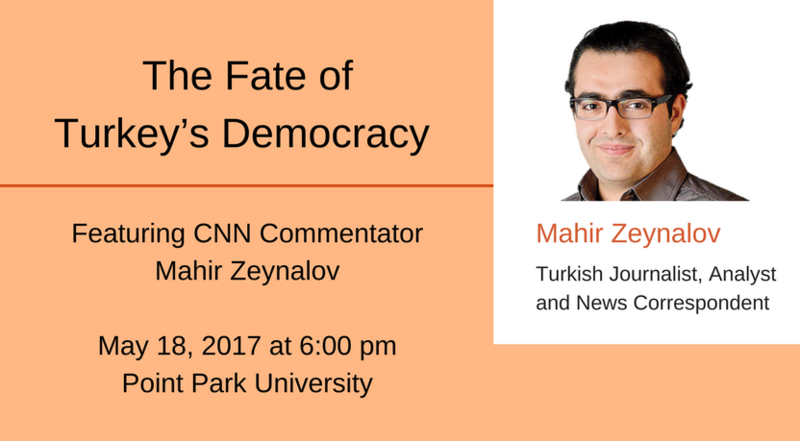 Mahir Zeynalov is a Turkish journalist and analyst who rose to international prominence for documenting the massive crackdown on journalists in Turkey. He is the first journalist asked by Erdogan to be imprisoned and the first journalist to be deported from Turkey. Now based in D.C., he is a frequent commentator on developments related to Turkey in major TV channels, including CNN, BBC, NBC and Al Jazeera. This event is presented free of charge in partnership with Point Park University’s Center for Media Innovation and the Turkish Cultural Center of Pittsburgh, but registration is required. To register for the event, please visit www.worldpittsburgh.org/event/fate-turkeys-democracy or call 412-281-7970.